Victor Talking Machine Company, publisher. Page 10 of the Victrola Book of the Opera, 1919. 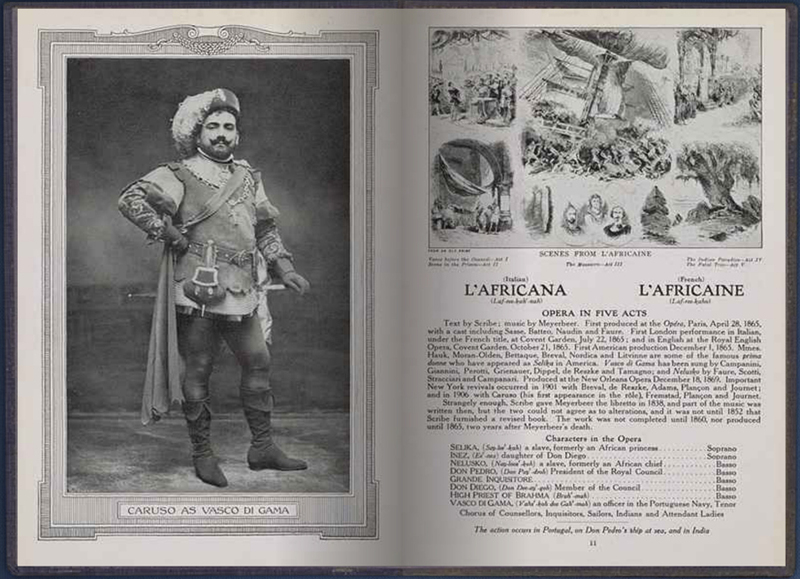 “L’Africana – L’Africaine.” Library of Congress interactive digital book. Summary: The 1919 edition of the Victrola Book of the Opera describes more than 110 operas, and is reproduced here as an interactive digital facsimile. It includes plot synopses and lists of recordings the Victor Talking Machine Company offered in 1919. In addition to reading the original text, you can listen to nearly every recording listed in the book and even compare different interpretations of the most popular arias of the period. Explain what you know about opera. Click the image above to access the digital book. Choose one opera and read the description. Summarize the story for a friend. Listen to one of the songs from the opera you selected. Listen to it once. Then fill out a sensory exploration chart as you listen to the recording again.